Seton's Emergency Tags are backed by our 100% Satisfaction Guarantee! Select from a wide variety of Emergency Tags at competitive prices. Plus most of our top-quality Emergency Tags are in stock and ready to ship today. Emergency shower inspection tags show the inspection information dealing with emergency shower units in your facility. Danger emergency shut-off valve accident prevention tags inform employees of important equipment functions in order to prevent accidents and injuries. 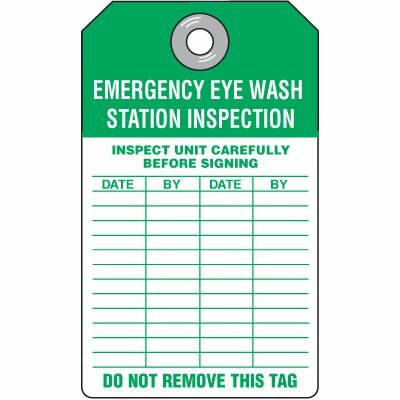 Emergency shower & eyewash location tags displays the location of the unit, and provide a record of the last inspection.